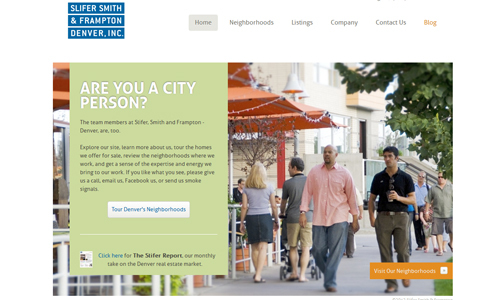 After many months of preparation, Slifer Smith and Frampton – Denver has launched it’s new website! Being a general brokerage house in Denver, we felt it was very important to highlight neighborhoods other than just Riverfront Park. While we know Riverfront Park better than any other brokers in the city, we also have a wealth of knowledge when it comes to other city close neighborhoods. Check it out, I will be posting blogs on www.SliferDenver.com as well as www.mydenverloft.com.